Welcome and thank you for visiting our web site. 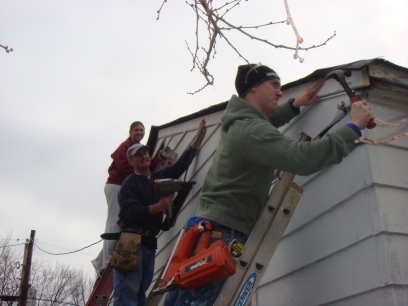 The Sunday Samaritans are a group of folks who serve the poor in the greater Memphis area, mainly by doing home repairs once a month on Sunday afternoons at no cost to the homeowner. Like the "good Samaritan" who helped the man in need on the road side, we attempt to help those in need in our community. After telling the story of the good Samaritan, Jesus said go and do likewise. We take this to heart. If you are intersted in learning more about us, click here. On this web site you can see pictures of some of the jobs we've done. We also have a list of upcoming and previous projects. If you are interested in helping, you can contact us using the information on the contact us page. If you have any questions, you can check the FAQ page for answers. Our next project is Sunday April 28 (This will serve as our May Project). For our next project we will be building a handicap ramp for Randy & Becky Fowler. Randy had a bad fall and has been in the hospital for months. (Yes months!) He will be in a wheel chair while recovering and can really use this ramp. The address is 4831 Shadow Pine Cove, Arlington TN 38002. We will meet at the job site at 12:30 pm. Thank you for your love of helping others.